Dom Marmion was a priest of Dublin Diocese who ministered in Dundrum before teaching in Holy Cross College. In 2000, parishioners of Dundrum celebrated his beatification and continue to pray for his intercession. The Dom Marmion Society, who care for the elderly in the area, continue to draw inspiration from him. Last October, the parish commissioned iconographer Mihai Cucu to write an Icon of Blessed Columba Marmion. The Icon will show key elements of Dom Marmion’s life and spirituality. To mark the occasion of the unveiling and blessing of our new Icon, we cordially invite you to join with us for Evening Prayer on Sunday 30th September at 5pm. Archbishop Diarmuid Martin will bless the new Icon that evening. Dom Columba McCann of Glenstal Abbey, Vice Postulator of the Cause of Blessed Columba Marmion, will lead us in reflection on Blessed Columba Marmion and his inspiration to us today. The parish extends a special invitation to religious men and women to attend this time of prayer and appreciation of the life of Bl. Columba Marmion. On the Solemnity of the Annunciation, 9th of April 2018, where we celebrate the gift of Mary’s ‘YES’ to be the Mother of the Emmanuel, Pope Francis gave the Church and the world a ‘gift’ in the new apostolic exhortation on holiness, ‘Gaudete et Exultate’ (Rejoice and be glad). It is available on the Vatican website or a PDF here. 1. The Pope is encouraging and challenging us on the path to holiness because holiness is necessary for our happiness – in order to bring out the best of who we are and to embrace the unique plan of God for us and for the world. 2. He is clear that our personal call to holiness entails action and is achieved in the context of the saints in heaven, our communities around us and the wider, suffering of our brothers and sisters. 3. The Pope offers practical support and advice for our journey – how to get there as well as warning of dangers facing us on our journey. Dangers in false forms of holiness, violence in our thoughts and daily lives, digital communications, consumerism as well as the very real and present danger of satan himself. The Pope asks us to discern any traces of these blocks to holiness in our lives and warns us not to let our guard down – our path to holiness is a spiritual battle. 4. He encourages us each of us in our own way to live out the Beatitudes in our lives – giving very practical ways of how to take on these challenges. 5. Pope Francis offers five great expressions of love of God and of neighbour that he considers of particular importance in the light of certain dangers and limitations present in today’s culture: Perseverance, Patience, Meekness, Joy and a Sense of Humour, Boldness and Passion. These signs of true holiness make it possible for us to give a witness of holiness in our fast-paced, noisy and aggressive world. 6. In order to be able to reach out to others he urges us to live lives of simplicity resisting the demands of a consumerist society that leaves us unsatisfied and anxious. 7. Holiness is found in everyday people and everyday things but he repeats throughout the document that our striving for holiness must be grounded in prayer and discernment so that our lives are transformed in the light of mercy and Grace. He is clear that holiness can only be achieved in the power of the Holy Spirit and through union with Jesus – sometimes born in heartache and sorrow but always listening to the Lord. The Pope strongly urges us to spend time with Jesus in silence, contemplating Him in order to restore our humanity and enable us to reach out to others. 8. He maintains that this attitude of listening entails obedience to the Gospel and to the Magisterium and is not a matter of applying rules but in discerning the Spirit for our time with the dynamic capacity to pose questions, doubts and inquiries. Contrary to the promptings of the Spirit, the life of the Church can become a museum piece or the possession of a select few. 9. He ends the exhortation on a note of joy and rejoicing, encouraging us to go to where humanity is most wounded and where people are seeking an answer to the question of life’s meaning. 10) The Pope writes this exhortation as one who walks and prays beside us so that our desire for God finds expression in our daily lives and enables us to share a happiness that the world cannot take from us. St. Josephine Bakhita, born in South Sudan, a survivor of human trafficking who later became a religious in the Institute of St. Magdalene of Canossa was canonized in 2000. This feastday is now an annual event against slavery and trafficking in all parts of the world. The UISG/USG launched the initiative in 2014, and see it as a first step in a continual campaign through Talitha Kum – the office at UISG which co-ordinates 24 networks of religious working against trafficking worldwide. We pray for all the victims of trafficking and also for those who work to free them and walk with them in your journey to recovery. We pray especially for the religious in our Archdiocese and through Ireland who work in this very sensitive and dangerous ministry. 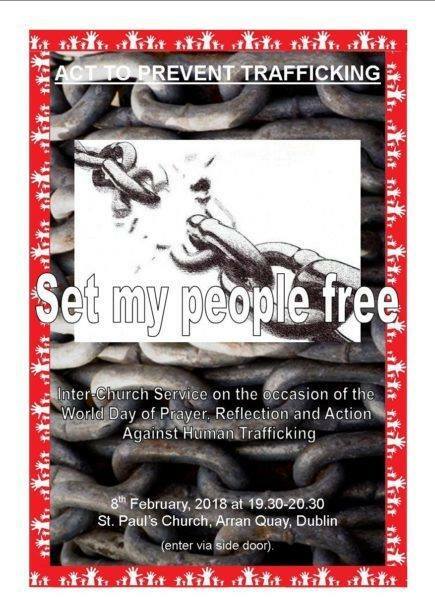 Tonight in St. Paul’s Church, Arran Quay, there will be an Inter-Church Service for the World Day of Prayer, Reflection and Action against Human Trafficking, from 7.30 p.m–8.30 pm. All are welcome. On the 3rd of February 2018, the Diocesan celebration to mark the Day for Consecrated Life took place in the Carmelite College Chapel in Terenure. The prayer service was presided over by His Grace Archbishop Diarmuid Martin, D.D with the participation of numerous consecrated men and women from the different Congregations, Institutes and Societies in the Archdiocese. The service with the theme “New wine, new wineskins”, was beautifully enhanced by the Dublin Diocesan Choir and musicians in the recently renovated college chapel of the Carmelite Fathers. The celebration continued afterwards with the gracious hospitality offered to us by the Carmelites , allowing the opportunity to catch up and meet new religious who are in the Archdiocese. A lovely afternoon was had by all as we continue to thank the Lord for the great gift that the religious are to our Archdiocese. Pope John XXIII set out what this involves with extraordinary clarity at the opening of the Second Vatican Council:“The substance of the ancient doctrine of the deposit of faith is one thing, and the way in which it is presented is another. Our duty is not only to guard this precious treasure, as if we were concerned only with antiquity, but to dedicate ourselves with an earnest will and without fear to that work which our era demands of us”. The new wine is not a collection of dogmatic texts: it is Jesus himself. The consecration of religious is not a consecration to formulae, but to a person who leads us and accompanies us along a path of a different life. That great homily of Pope John at the opening of Vatican II began with the words Gaudet Mater Ecclesia, Let our Mother the Church rejoice. Both Pope John and Pope Francis experienced criticism and even rejection. Some would prefer the stuffiness of a solid over mature wine to the challenges and freshness of a new wine that is full of sparkle. The newness of the Gospel is a challenge that endures right throughout our lives, which can change and renew us at any age, and indeed which we must allow change us at any age. Nationwide on RTE recently did a programme on recent entrants to the Dominican Order. It is available online to watch here. We offer our sincere condolences to our Sisters in the Monastery of St. Joseph, Kimacud, on the passing to eternal life of Sr. Anne Cunningham, OCD (Sister Anne of Christ). Sr Anne had lived the Carmelite life in the Carmels of Presteigne, Wales and Benoni, South Africa. May the fidelity and witness that she gave throughout her long life be a source of consolation to her Sisters and family, as well as an inspiration to those seeking to understand God’s plan for their lives. Requiescat in pace Sister Anne. In the month of December, the Episcopal Vicar for Religious, Mons. John Dolan and the Assistant Vicar, Sr. M. Louise O’ Rourke, pddm, visited the female monasteries in the Archdiocese of Dublin. The visitations were a great opportunity to thank the Sisters for their prayerful witness and support to the Archdiocese, as well as an opportunity to look at the future of monastic life and the challenges which may present. Each Monastery was a reflection of how the Holy Spirit inspires in so many different ways, attuning to the call to follow God in the particular vocation as monastic sisters. It was a joy to spend time with our Sisters and we are indebted to their intercession for us all. On the 16th of December 2017, in the Church of St. Patrick, Corduff, Archbishop Diarmuid Martin ordained John Regan (Pallottine) and Samson Mann (Spiritan) to the diaconate. We wish them both every blessing as they continue on their journey towards priesthood. Congratulations to the Holy Faith Sisters and friends and the Holy Faith Past Pupils’ Choir for the beautiful celebration of the Eucharist which was broadcast on RTE on Sunday the 8th of October 2017, as they celebrated 150 years of Holy Faith life and service. If you missed it, it can be viewed here. L’Osservatore Romano, weekly edition in English, number 15, 14 April 2017. We join in congratulating Sr. Orla Treacy, Loreto Sister who was named as this year’s recipient of the International Humanitarian Award. Thank you to Catholic Ireland for this article. A Loreto Sister in South Sudan has been named as this year’s recipient of the Hugh O’Flaherty International Humanitarian Award. Sr Orla Treacy lived in Tralee as a young child before her family moved to Bray in Co. Wicklow, and she was professed a nun in 2005. Sr Orla is now the Principal of Loreto Secondary School in Rumbek in Lakes State in South Sudan. This is the tenth year of the memorial commemoration of the Monsignor, organised to raise awareness of his humanitarian work during World War II, when he and his colleagues in the Rome Escape Line saved over 6,500 people from the clutches of the Nazis who had occupied Rome at the time. Sr Orla was nominated by Martin Rosney from Bray, Co. Wicklow. Sr Orla was born in 1973 and she moved with her family at the age of two to Tralee, where her father Blaise Treacy took up the position of Kerry County Secretary. She was educated at Presentation Convent, Tralee until the age of six, when her family moved to Bray, Co. Wicklow, where she attended Loreto in Bray, completing her Leaving Cert in 1991. Having studied at the Mater Dei Institute, she subsequently taught in Presentation College Cork, Loreto Letterkenny, St Muredach’s College, Ballina and Loreto Crumlin. After spending a summer in India with the Loreto Sisters, at the age of 24 she decided to join the Order. Based at the Loreto Convent in Rathfarnham, she was professed as a Loreto Sister in September 2005. Within a year, she headed to the large African state of Sudan with four other Loreto nuns to establish a mission in a diocese the size of Italy but with just two secondary schools. She has spent the past 11 years in Sudan, experiencing the trauma of South Sudan becoming an autonomous independent state in 2011 followed by civil war in 2013. Today, South Sudan is widely considered one of the most fragile states in the world, with continuing conflict and unrest. Sr Orla will be presented with the award by Cathaoirleach of Killarney Municipal District Niall Kelleher at a ceremony in the Killarney Avenue Hotel on the evening of 4 November. “This is the first time that I’ve witnessed people scavenging in rubbish heaps to get food for themselves…Our men are just trying their best to stay along with the people and be with them and serve them – to accompany them, really – they don’t want to leave them,” (Fr. Joe McGee, Provincial of the Sacred Heart Missionaries). The Irish Catholic recently ran a news feature on the work of the Sacred Heart Missionaries out in Venezuela which is going through a turbulent time. Fr. Joe McGee, Provincial, went out to assess the situation where his confreres live and minister. The Sacred Heart Missionaries are present in the Archdiocese of Dublin. Congratulations to Sr. Jacinta from the Redemptoristine Monastery who celebrated 70 years of monastic life on the 15th of August 2017. May the Lord continue to bless you and may you continue to be a blessing for many! Photos from the celebration can be viewed here. Thanks to the Dominican Sisters for forwarding on this news. As part of the ceremony Sabine made final profession into the hands of the Congregation Prioress, Sr. Elisabeth Healy OP. According to our Dominican Tradition the only vow explicitly named in the profession is that of obedience, which is understood to embrace the vows of poverty and chastity. It was a beautiful day, marked by the choir of Dominican sisters whose singing held the beauty of the Dominican tradition of liturgical prayer. Sr. Sabine felt the joy and prayer of so many sisters, family members, including her mother, father, family and friends who had travelled from her native Germany, and others who have journeyed with her to this day and who will continue to be of support to her along her path as a member of the Congregation of Dominican Sisters, of Our Lady of the Rosary and Saint Catherine of Siena, Cabra. Ordination of Fr. Philip Mulryne, OP. Congratulations to Fr. Philip Mulryne, OP, who was ordained as a Dominican priest by His Grace Archbishop Joseph Augustine Di Noia OP during the 11.00am celebration of Mass in Saint Saviour’s Church, Dominican Street, on the 8th of July 2017. Archbishop Augustine Di Noia is Assistant Secretary at the Congregation of the Doctrine of the Faith. “On the 29th of June 2017, I had the great joy to participate in the ordination of my friend and fellow religious, Charles Lafferty, SAC. Throughout the years, I have count myself truly blessed to have shared in the journey to priesthood of different friends within the Pallottine Family and other religious orders. Together with Sr. Eileen and Sr. Sabine, Dominican sisters, we had all ministered with Charles in the group ‘Religious in Formation’ so it was with joyful spirits that we travelled from Dublin to Derry for this great day. However it is thanks to Youth 2000 that led our paths to cross earlier with Charles. Indeed Youth 2000 was well represented as it also acknowledged the generous volunteering and support that Charles has been to the group over the years. Fr. Charles was ordained in his home parish of Ardmore, Derry. It is always very special to see how the parish prepares for this day. It was truly a celebration of faith and family. As the proverb goes, it takes a village to raise a child. So too, it takes a parish to raise a priest! At the back of the booklet where Fr. Charles penned some words of thanks, it was obvious that so many people had been part of the great mosaic of his life and contributed to forming him on many different levels. This is the beauty of the Christian journey. None of us travel alone but we are pilgrims together on the road of life. As Fr. Charles continues for a new stage of ministry and service as a priest in the Pallottine Order, we wish him all the best and assure him of many prayers and remembrances in daily Adoration., especially as his new mission brings him to Argentine shores. You can read Fr. Charles’ homily for his first Mass here . The homily from the ordaining bishop, Bishop Donal McKeown, can be read here. Congratulations to the Greyfriars (OFM Conv) and especially to Fr. Rory Doyle, OFM Conventual who was ordained on the Feast of the Annunciation, 25th of March 2017, by Archbishop Kevin McDonald, Archbishop Emeritus of Southwark. Fr. Rory spent his deaconate year in Fairview community, Dublin, and is now back in this community after the celebrations of the weekend! Ad multos annos Fr. Rory! The lowest rung of this moral degradation is pride. The rich man dresses like a king and acts like a god, forgetting that he is merely mortal. For those corrupted by love of riches, nothing exists beyond their own ego. Those around them do not come into their line of sight. The result of attachment to money is a sort of blindness. The rich man does not see the poor man who is starving, hurting, lying at his door. Looking at this character, we can understand why the Gospel so bluntly condemns the love of money: “No one can be the slave of two masters: he will either hate the first and love the second, or be attached to the first and despise the second. You cannot be the slave both of God and of money” (Mt 6:24). We are glad to let you know that the 11th annual Candleweek in Cherry Orchard is fast approaching. Join us every night @ 7.30pm from Monday 27th February – Friday 3rd March in Cherry Orchard Parish Church for our annual mission week, better known locally as candleweek. Candleweek brings the community of Cherry Orchard together in a fun and interactive way as we celebrate and inspire trust in God and in each other.Each night the local parish team & volunteers put on joy-filled liturgies which explore and celebrate our faith.As well as joining us each evening in person, you can also follow us on twitter @candleweek for updates, our Facebook page ‘Cherry Orchard Parish’. Or contact info@cherryorchardparish.com. An Misean sa tSín is a short multilingual documentary series looking at four decades of Irish catholic missionary activity in China. From 1920 to 1954, hundreds of Irish men and women served as Roman Catholic missionaries working in social, pastoral and disaster relief services at an extraordinarily turbulent but fascinating period of Chinese history. Ordinary Irish people made a commitment to serve their church and engage with a profoundly different culture at the other side of the world. The programmes will be screen by TG4 on Monday evenings at 19.30 over four weeks beginning 13th March 2017. Thanks to the Carmelite Fathers (O.Carm) for this great quote on their website. Happy St. Valentine’s Day to all our brother and sister religious in the Archdiocese! The Pope began with a reflection on the needs of young people. He spoke of the culture that many genuinely good young people are exposed to in today’s society: a worldly culture in which young people are tempted by a vision of their lives where success and happiness can be attained easily at any price, through easy money and easy pleasure, through power or material prosperity. He felt that what was important in fighting this worldly culture was precisely something that religious life can offer in a special way. He said that our task in the face of such a worldly culture was to witness to a culture which prized something else: the joy of the Gospel and the joy of belonging to Jesus Christ. This is the role of religious life; this is your calling in today’s world, a counter cultural calling but a counter-cultural calling which is anything but is irrelevant. We have to ask ourselves what young people today need from religious. They need religious who by their detachment from any seeking for power and wealth and pleasure attract young people to the unique joy and fulfilment which come from knowing Jesus Christ and thus allow Jesus Christ to help young people break out of self-centeredness, conformism and worldliness. Young people have few opportunities to get to know what holiness means in their lives. They need teachers of prayer, teachers of generosity and care and teachers of faithfulness. Working with young people is not just a task for young people. Young people look for wisdom and wisdom comes very often with experience of life. The value and the witness of religious life does not cease by establishing a retirement date. Pope Francis himself is an example of how a man of now over 80 years of age can communicate with young people. Pope Francis stressed that if religious life is to maintain its service and prophetic mission and fascination, then it must always reflect the freshness the newness of the message of Jesus Christ. He said that any religious community should be marked by hope and joy. Only in this context will religious life influence young people who are seeking meaning in their lives in a confused world. He then stressed that this calling of religious is not just an individual call. So many young people find themselves today in a lonely and isolated world. They need the witness of what community means. They need models of community life which show different forms of how people can relate in a mature and disinterested manner. From religious life young people should be able to draw inspiration through how religious work together, how they help and support each other in relationships which go way beyond just personal interest. Jesus is present not just in individual hearts, but his message of mercy and love is witnessed through the way Christians live and the way religious life epitomises that new way of living. And when I say talk I am not speaking necessarily about words, but about the language of personal integrity. Each congregation has a charism of its own and each congregation can reach out to young people through infecting them with the attractiveness of that charism, that attractiveness which drew each one of you to your vocation. Practical and direct man that he is, Pope Francis did not fail to point out the possible negative side of the way religious is sometimes lived. Pope Francis says nice things, but he is not one who leaves us in our own comfort zone. One of his talents if we listen to him attentively is to make us all with leadership roles in the Church feel uncomfortable. He pointed to the challenges which make religious give up or become half-hearted: tiredness, routine, the weight of managing structures which are at the end of their sell by date, internal divisions, authority which becomes authoritarian. Sometimes people that Pope Francis can be overcritical of people who feel they are doing their best and from whom you cannot expect more. Pope Francis challenges us to do more because he believes we are all capable of doing more by allowing the strength of Jesus to work through us and, in your case, because he feels that the world needs the witness of religious life. The challenge of the Christian message is for us to reach out beyond our own comfort into the unknown and the unknown makes us feel uncomfortable. On this Feast we can draw strength from Mary who day by day learned to open her heart in trust into the unknown which Jesus opened for her. She became the model for all of us, called to be missionary disciples of Jesus in today’s world. We give thanks to God for the witness of religious life over generations and we turn to the future with hope and courage. And I thank each of you for the witness of faith you have brought and still bring to this faith community of the Archdiocese of Dublin. The next day for women (25 – 45 years) interested in exploring a vocation to the Caramelite Contemplative Life is on Saturday 4th March from 10.30 a.m. until 3.40 p.m. It will take place at the Carmelite Monastery, Delgany. A Monastic Vocations Weekend will take place from Friday, February 17th 2017 at 2:30 pm until Sunday, February 19th 2017 at 1:00 pm. Click for PDF printable version. “In the second half of the nineteenth century the geography of this part of Dublin was changing and was being marked by a growing and extensive presence of Catholic Institutions. It was a clear sign of courage and purpose by the Catholic community of the time, especially by Cardinal Cullen and later by his successor Cardinal McCabe, the then Archbishops of Dublin. Newman’s Catholic University was to be constructed on Saint Alphonsus Road where the current Redemptoristine Convent now stands. All Hallows College, a remarkable and unique institution, was being built to provide for the training of priests who would go and spread the Gospel and in many ways establish and consolidate local churches right across the English-speaking world. Saint Patrick’s Training College in Drumcondra was established which would provide generations of teachers who would be the backbone of that Irish primary educational system from which so many have benefitted for well over a century. The Seminary at Clonliffe was opened in 1860 and through its links with the Royal University College in Dublin aimed to provide a high level of intellectual formation for the future priests of Dublin. 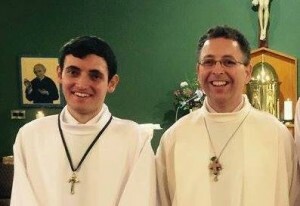 Together with the Pallotine Family in Ireland, we thank God for the ordination of two new priests in the month of July. Fr. Jaimie Twohig, SAC was ordained in the Church of St. Joseph, Little Island, Cork and Fr. Brendan McCarrick, SAC, was ordained on the 25th of July in the Diocese of Achonry. Both men carried out their studies in Dublin. The homily for Fr. Brendan for the ordination can be read here. We assure both of them of our prayers as they begin this new stage of their journey. The Irish Dominican friars rejoice as eight of their brothers were ordained to the priesthood in Saint Saviour’s Dominican Church, Dominick Street in Dublin on the 9th of July 2016. The ordaining prelate was Archbishop Robert Rivas OP of the Diocese of Castries in the Caribbean. Archbishop Rivas is part of the Irish Dominican province and came specially over to ordain the eight brothers in this special year of the 800th Jubilee of the Dominican Order. The brothers ordained to the priesthood are Brs.David McGovern OP, Damian Polly OP, Ronan Connolly OP, Pat Desmond OP, Daragh McNally OP, Connor McDonagh OP, Eoin Casey OP and Kevin O’Reilly OP. We thank God for the gift and the vocation of these men and pray for their perseverance. You can see a video of the celebration here and the photo gallery is available here. New CD ‘JOURNEY TO YOUR HEART’ by Sr.Marie Dunne CHF was released recently. The compilation includes a variety of spiritual and inspirational songs and some new settings to a number of the psalms. These include a setting to Psalm 130 WITH THE LORD THERE IS MERCY AND LOVE – suitable for this Jubilee Year of Mercy. The Religious Life Vitality – CORI Conference Papers are now available on line at the following link: CORI. Congratulations to the Capuchin Fathers for their prayerful and inspiring liturgies which were aired by RTE over the past few days. The Easter Vigil Mass can be viewed here and the Mass of the Resurrection for Easter Sunday can be viewed here. We pray that these joyful and faith-filled ceremonies may be a reminder to many of the gift of faith and the power of the Resurrection. The Office for Religious wishes to convey their condolences and their prayers on behalf of the religious of the Archdiocese to the Missionaries of Charity who are present here in Dublin, on the death of their four sisters in Yemen. Four gunmen attacked an old people’s home in the Yemeni port of Aden on the 4th of March, killing at least 16 people, including the four sisters. Two of the slain nuns were from Rwanda and one each from India and Kenya. The nuns also came under attack in Yemen in 1998 when gunmen killed three of them in the Red Sea port city of Hodeida. We continue to pray for the safe return of Fr. Tom Uzhunnalil, a Keralite Salesian priest belonging to Bangalore Province of the Salesian Fathers. He was kidnapped in the same ambush. Men and women religious, that is men and women consecrated to the Lord’s service, who in the Church pursue this path of arduous poverty, of a chaste love that leads to a spiritual fatherhood and motherhood for all the Church, of obedience…. There is always something lacking in our obedience, because perfect obedience is that of the Son of God, who emptied himself, who became man out of obedience, unto death on the Cross. There are men and women among you who live out an intense form of obedience, an obedience — not military, no, not that; that is discipline, another thing — an obedience of giving of the heart. This is prophecy. “Don’t you wish to do something, something else?…” — “Yes, but according to the rules I must do this, this and this. And according to regulations, this, this and this. And if I don’t see something clearly, I speak with the superior and, after the dialogue, I obey”. This is prophecy, as opposed to the seed of anarchy, which the devil sows. “What do you do?” — “I do whatever I please”. The anarchy of will is the daughter of the demon, it is not the daughter of God. The Son of God was not an anarchist, he did not call his [disciples] to mount a force of resistance against his enemies; he said to Pilate: “Were I a king of this world I would have called my soldiers to protect me”. Instead, he was obedient to the Father. He said only: “Father, please, no, not this chalice…. But Thy will be done”. When out of obedience you accept something which perhaps often you do not like… [he makes a swallowing gesture]… that obedience must be swallowed, and it is done. Thus, prophecy. Prophecy is telling people that there is a path to happiness and grandeur, a path that fills you with joy, which is precisely the path to Jesus. It is the path to be close to Jesus. Prophecy is a gift, it is a charism and it must be asked of the Holy Spirit: that I may know that word, in the right moment; that I may do that thing in the right moment; that my entire life may be a prophecy. Men and women prophets. This is very important. “Let’s do what everyone else does…”. No. Prophecy is saying that there is something truer, more beautiful, greater, of greater good to which we are all called. Then another word is proximity. Men and women consecrated, but not so as to distance themselves from people and have all the comforts, no, [but rather] to draw close and understand the life of Christians and of non-Christians — the suffering, the problems, the many things that are understood only if a consecrated man and woman is close: in proximity. “But Father, I am a cloistered nun, what should I do?”. Think about St Thérèse of the Child Jesus, patron saint of the missions, who with her ardent heart was close, and the letters she received from missionaries made her closer to the people. Proximity. Becoming consecrated does not mean climbing one, two, three steps in society. It is true, so often we hear parents say: “You know, Father, my daughter is a nun, my son is a brother!”. And they say it with pride. And it’s true! There is satisfaction for parents to have consecrated children, this is true. But for consecrated people it is not a life status that makes me look at others like this [with detachment]. Consecrated life should lead me to closeness with people; physical, spiritual proximity, to know the people. “Ah yes Father, in my community the superior gave us permission to go out, to go into the poor neighbourhoods with the people…” — “And in your community, are there elderly sisters?” — “Yes, yes… there is a nurse, on the third floor” — “And how often during the day do you go to visit your sisters, the elderly ones, who could be your mother or your grandmother?” — “But you know, Father, I am very busy with work and I can’t go…”. Closeness! Who is the first neighbour of a consecrated man or woman? The brother or sister of the community. This is your first neighbour. A kind, good, loving closeness, too. I know that in your communities there is never gossip, never, ever…. A way of distancing oneself [is] to gossip. Listen carefully: no gossip, the terrorism of gossip. Because those who gossip are terrorists. They are terrorists in their own community, because like a bomb they drop a word against this one or that one, and then they go calmly. Those who do this destroy, like a bomb, and they distance themselves. This, the Apostle Santiago said, was perhaps the most difficult virtue, the most difficult human and spiritual virtue to have, that of bridling the tongue. If it comes to you to say something against a brother or sister, to drop a bomb of gossip, bite your tongue! Hard! No terrorism in the community! “But Father, what if there is something, a defect, something to correct?”. You say it to the person: you have an attitude that bothers me, or that isn’t good. If this isn’t appropriate — because sometimes it isn’t prudent — you say it to the person who can remedy, who can resolve the problem and to no one else. Understood? There is no use for gossip. “But in the chapter house?”. There, yes! In public, what you feel you have to say; because there is temptation not to say things in the chapter house, and then outside: “Did you see the prioress? Did you see the abbess? Did you see the mother superior?…”. Why didn’t you say it there in the chapter house?… Is this clear? These are virtues of proximity. The Saints, the consecrated Saints had this. St Thérèse of the Child Jesus never, ever complained about work, about the bother it was to bring that sister to the dining room every evening: from the choir to the dining room. Never! Because that poor nun was very old, almost paralyzed, she had difficulty walking, she was in pain — I understand her too! — she was even a bit neurotic…. Never, ever did she go to another sister to say: “How she bothers me!”. What did she do? She helped her sit down, brought her a napkin, broke the bread and did so with a smile. This is called proximity. Closeness! If you drop the bomb of gossip in your community, this is not closeness: this is waging war! This is distancing yourself, this is creating distance, creating anarchy in the community. In this Year of Mercy, if each one of you could manage to never be a gossiping terrorist, it would be a success for the Church, a success of great holiness! Take courage! Proximity! I am glad to meet with you at the end of this Year dedicated to consecrated life. One day, Jesus, in his infinite mercy, turned to each of us and asked us, personally: “Come, follow me”! (Mk 10:21). If we are here it is because we responded “yes” to him. At times it is treated as a bond filled with enthusiasm and joy, at times more difficult, perhaps uncertain. However, we have followed him with generosity, allowing ourselves to be led on paths we would have never even imagined. We have shared intimate moments with him: “Come away by yourselves […] and rest a while” (Mk 6:31); moments of service and mission: “You give them something to eat” (Lk 9:13); even his cross: “If any man would come after me, let him […] take up his cross” (Lk 9:23). He has introduced us into his very relationship with the Father, he has given us his spirit, he has expanded our hearts by the measure of his own, teaching us to love the poor and the sinners. We have followed him together, learning from him service, acceptance, forgiveness, fraternal love. Our consecrated life has meaning because dwelling with him and carrying him along the streets of the world, conforms us to him, makes us be the Church, a gift for humanity. The Year that we are concluding has helped to make the beauty and holiness of consecrated life shine more in the Church, strengthening in consecrated people gratitude for the call and the joy of responding. All consecrated men and women have had the opportunity to have a clearer perception of their own identity, and thus project themselves in to the future with renewed apostolic zeal in order to write new pages of good, in the wake of the Founders’ charism. We are grateful to the Lord for what he has given us in order to live in this Year so rich of initiatives. I thank the Congregation for the Institutes of Consecrated Life and Societies of Apostolic Life, which prepared and brought about the great events here in Rome and in the world. The Year has ended, but our commitment to be faithful to the call received and to grow in love, in giving, and in creativity continues. For this reason I offer you three words. The first is prophecy. It is a characteristic of yours. What prophecy does the Church and the world expect from you? You are called, first of all, to proclaim, with your life even before than with words, the reality of God: to speak God. If at times he is rejected or marginalized or ignored, we must ask ourselves whether perhaps we have not been transparent enough to his Face, showing our own instead. The Face of God is that of a Father “merciful and gracious, slow to anger and abounding in steadfast love” (Ps 103:8). In order to make him known it is important to have a personal relationship with him; and for this it takes the capacity to adore him, to cultivate friendship with him day after day, through a heart to heart conversation in prayer, especially in silent adoration. The second word I consign to you is proximity. God, through Jesus, made himself close to every man and every woman. He shared the joy of the spouses at Cana in Galilee and the anguish of the widow of Nain; he entered the house of Jairus, touched by death, and in the house of Bethany perfumed with nard; he took sickness and suffering upon himself, until giving his life as a ransom for all. Following Christ means going there where he has gone; taking upon oneself, as a Good Samaritan, the wounded whom we meet on the street; going in search of the lost sheep. Being, like Jesus, close to the people, sharing with them their joys and their sorrows; showing, with our love, the paternal face of God and the maternal caress of the Church. May no one ever feel distant, detached, closed and therefore barren. Each of you is called to serve our brothers and sisters, following your own charism: some by praying, some through catechesis, some through teaching, some by caring for the sick or the poor, some by announcing the Gospel, some by performing various works of mercy. 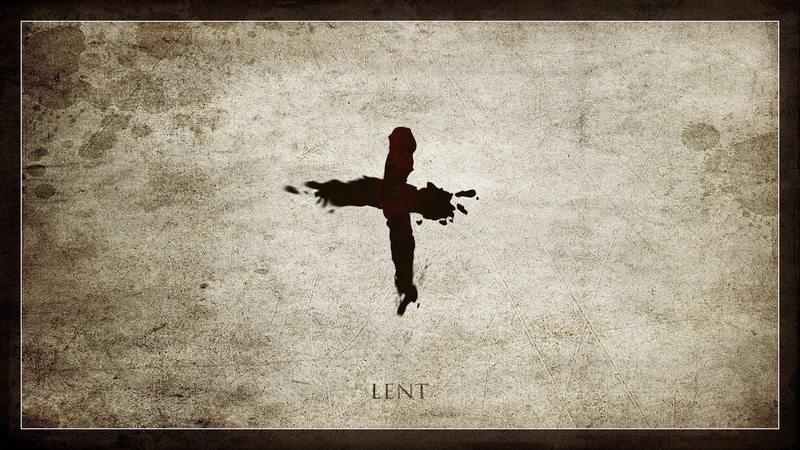 The important thing is not living for oneself, as Jesus did not live for himself, but for the Father and for us. Thus we come to the third word: hope. In bearing witness to God and his merciful love, with the grace of Christ you can instill hope in this humanity of ours marked by various reasons for anguish and fear and at times tempted to be discouraged. You can make felt the renewing power of the Beatitudes, of honesty, of compassion; the value of goodness, of the simple, essential, meaningful life. You can also nourish hope in the Church. I think, for example, of ecumenical dialogue. The meeting a year ago among consecrated people of various Christian confessions was a beautiful innovation, which deserves to be carried on. The charismatic and prophetic witness of the life of consecrated people, in its various forms, can help to recognize all of us more united and foster full communion. Dear brothers and sisters, in your daily apostolate, do not let yourselves be conditioned by age or by number. What counts most is the capacity to repeat the initial “yes” to the call of Jesus who continues to make himself heard, in an ever new way, in every season of life. His call and our response keep our hope alive. Prophecy, proximity, hope. By living this way, you will have joy in your heart, the distinctive sign of the followers of Jesus and more so of consecrated people. Your life will be more attractive to so many men and women, by the glory of God and through the beauty of the Bride of Christ, the Church. Dear brothers and sisters, I thank the Lord for what you are and do in the Church and in the world. I bless you and I entrust you to Our Mother. Please, do not forget to pray for me. The Year of Consecrated Life, which began on November 30, 2014, ended with prayer and gratitude. On Tuesday afternoon, February 2, 2016, the Feast of the Presentation of the Lord, Pope Francis presided at the Eucharistic celebration in St Peter’s Basilica along with thousands of consecrated men and women celebrating their World Day. In an interview with L’Osservatore Romano, Cardinal João Braz de Aviz, Prefect of the Congregation for the Institutes of Consecrated Life and Societies of Apostolic Life, gave an accounting and indicated the horizons of this Year. The following is a translation of the interview, which was given in Italian. Have the objectives proposed for the Year of Consecrated Life been reached? I have a deep sense of gratitude to God and to Pope Francis for this Year. It has been like a touch of grace for us and has revitalized hope. It has led us to look at consecrated life in a positive way and also at the problems that are there: this means actual problems, such as aging or the lack of vocations on certain continents. We have rediscovered that basically there is a special vocation which is an integral part of the Church. It is not an appendage, it’s not something temporary that is about to end, but is a gift of God to the community. It has been like this from the very beginning; and we are certain that God will continue to call, even in many new forms. This profound sense of gratitude and hope is extremely important. How is the Jubilee challenging consecrated people? In places where I have been I’ve seen that the Year of Mercy is being experienced as an appeal to bring our relationship with God back into balance. He is the judge, but he is merciful. This definition expresses the profound identity of God. And we must transform it into personal and communitary consciousness. The fact that God employs mercy with us means that we too are called to be merciful toward others. In this sense, our relationships with others change a great deal. How far along is the revision of the document ‘Mutuae Relationis’ on relationships between bishops and religious? We have consulted and we are working together with the [men’s] Union of Superiors General and the [women’s] International Union of Superiors General. It is a very fruitful collaboration. The Pope has defined two central principles to work on: the spirituality of communion and the co-essentiality of the hierarchical and charismatic dimensions. I think we have to look at the relationship between hierarchy and charisms in the sense of communion. In the spirituality of communion, indeed, the relationships complete each other and become true, positive. And this is how difficulties in relating are overcome. The second principle is that of bringing back to light the co-essentiality of the hierarchical and charismatic dimensions, because these two dimensions come from the beginnings of the Church. The Holy Spirit who speaks in both dimensions does not contradict himself. This has some practical consequences, such as the need to restore true relationships in truth, in mercy, and in freedom. We must find this maturity for the good of the Church. This means that we need to be much more committed on the journey of communion among all the institutes, and between the institutes and the local Churches. The above article was published on Tuesday, February 2, 2016 in the L’Osservatore Romano. Congratulations to Brendan McCarrick and Jaimie Twohig from the Pallotines Fathers who were ordained as deacons on the 17th of January 20156 by Bishop Seamus Freeman, SAC. You can read more about the event and also their vocation stories here. Bishop Seamus’ homily can be read here. Congratulations and prayers to Br’s Pat Desmond and Kevin O’Reilly, Dominican brothers, who were ordained as deacons on the 6th of January 2016 by the Archbishop of Dublin, Diarmuid Martin. 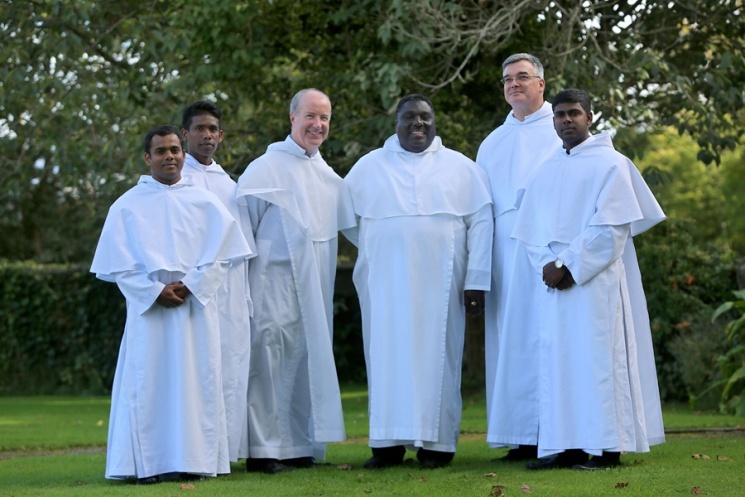 This brings to 8 the number of deacons within the Irish Province of the Dominicans. As Fr. Gregory Carroll, the Dominican Provincial, remarked: “there is a deacon for every 100 years since the start of the Dominican years. The Dominicans, in fact, celebrate their 8ooth jubilee year this year. The homily given by Archbishop Martin can be accessed here. We continue to pray for these new deacons as well as their Dominican brothers as they prepare for their priestly ordination in the summer. The Vatican’s Congregation for Institutes of Consecrated Life and Societies of Apostolic Life recently released a new document focused on the role and vocation of religious brothers in the life of the Church. The document, entitled ‘Identity and Mission of the Religious Brother in the Church’, was presented at a press conference by the head of the Congregation, Cardinal João Braz de Aviz, and its secretary, Archbishop José Rodríguez Carballo. The document refers to some of the most famous brothers of the East and Western traditions, such as St Anthony, St Pachomius, St Benedict and St Francis, as well as the founders of more recent orders and institutes dedicated to different areas of religious life. It underlines the prophetic role of religious brothers, as well as that of consecrated women or sisters who similarly dedicate their lives to God. Since that “vocation of religious men and women is not always well understood and appreciated within the Church”, the document says it hopes to shed light on the value and vital role that such people play in reflecting the face of Jesus who told his followers that “You are all brothers”. You are cordially invited to attend the Diocesan Liturgy for the closure of the Year of Consecrated Life. The liturgy will take place in the Church of St. Therese in Mount Merrion on the 2nd of February at 7.30 pm. If you missed the fine presentation on Nationwide (1/10/2018) of the new Nano Nagle Centre in Cork, testimony to the wonderful vision of Nano Nagle, foundress of the Presentation Sisters (PBVM), you can watch it on RTE Player at this link.